The new season of DEXTER will be on tonight!!!!! For those of you who don't know what Dexter is about, I'll explain. Dexter is a forensic Blood Splatter analyst who is also a serial killer. He kills those who have gotten away with their crimes. Very good stuff! Okay this is one of my FAVORITE television shows. I just love all the crime series......Dexter, CSI, Cold Case, just to name a few. It's no wonder I'm scared when I'm home alone at night. Never the less, I love them. We started watching Dexter when we lived in Germany. I was instantly hooked on it. It's my one and only reason for justifying the OUTRAGEOUS cable bill I pay. I need to have Dexter....and True Blood. 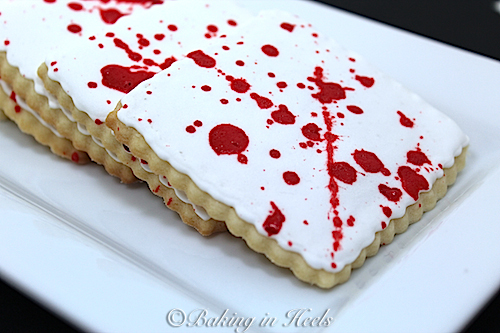 With the upcoming premiere of Dexter Season 6, it was no surprise, I had to make some cookies. There were so many ideas floating around in my head with this one. The design I settled on was quite simple. As a matter of fact, my three year old did the blood splatter. These are great cookies to make for a beginner. Make cookies using your favorite sugar cookie recipe. Allow to cool. Outline cookies with white royal icing using #2 tip. Let dry 30 minutes. fill entire cookie with royal icing. Allow to dry completely. 6-8 hours. thin down red royal icing to the consistency of milk.....very watery. Dip paint brush into thin red royal icing. Splatter the cookies. DO NOT touch cookie with paint brush. You are just slinging the icing on the cookie for a splatter effect. Allow cookie to dry a few hours. This cookie is so EASY even a beginner can do it. Like I said, my three year old did the splattering. It wasn't mess free, but it was FUN for her. So who else watches Dexter? Are you ready for the season premiere tonight? I rarely watch TV. Dexter is one of the few shows I do watch.